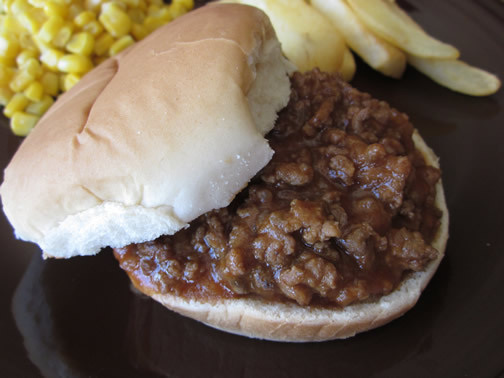 This week on Menu Plan Monday we are supposed to post a recipe that is a favorite of our family. Because our week is yet another busy one where we won't always make it home for dinner, I'm glad to share some of the things we usually like to eat since our menu this week isn't going to be all that exciting. Corey has scouts on Monday, I have my Family Reading Night on Tuesday, Corey has confirmation on Wednesday and a cross country meet on Thursday, and Friday night I host my church book club. Saturday is kind of exciting as Corey has his first math contest this year, and he is on the high school math team (even though he is in 8th grade)! It will be a challenging but fun day for him. Here is our very boring menu for the week. For more menus, see orgjunkie.com. 6 cups thinly sliced apples (about 6 medium) - I like to use a variety of different types in the pie. Heat oven to 425 degrees F. Mix white sugar, flour, nutmeg, and cinnamon. Stir in apples. Turn into pastry-lined 9" pie plate; dot with butter, and sprinkle with brown sugar. Cover with top crust; seal and flute. Cut slits in top crust to vent. Cover edge with foil; remove foil during last 15 minutes of baking. Bake until crust is brown and juice begins to bubble through slits in crust, 40-50 minutes. Well, we survived the Eagle Scout project this weekend. Corey's race went off without a hitch. The weather even cooperated and didn't rain on us as predicted. He raised over $4000 for his Shoes for Kids project. We are very proud parents. :) Because of preparations for the race, I didn't get to a couple of my menu items (Eric's parents took us out to eat! ), so you might see a repeat or two this week. Because Corey has two cross country meets and I have eMINTS training, we are going to be relying on freezer staples this week. I hope the menu helps you anyway. For more menu ideas, go to orgjunkie.com. Here's a little movie of the apron I made for my partner in the Fall Flirty Apron Swap. We had to make an apron of their vacation request, and my partner wanted to go on a cruise vacation. Believe it or not, I actually cooked all of the things on my menu last week! Woo hoo! I did shift a couple of days around, but it still counts. :) I made a new breakfast meal this week - zucchini frittata - which was inspired by the wonderful breakfasts we had at the Alpine House this summer on vacation in Wyoming. It turned out great, and I was pleased with how easy it was to make. I did have a nice surprise at the end of the week when my Boo Spooky Apron Swap package arrived in the mail. The apron my partner made for me was really cute. I hope she likes hers as well. This week we are extra busy helping Corey finish up preparations for his Eagle Scout project. He is hosting a 5 K run, with proceeds going to purchase new shoes for needy students in our school district. I also have eMINTS training and open house this week, so our meals will be simple, and unfortunately, we have to eat out more than I would like. Here's the menu for this week. Maybe it will help you out if you are having an extra busy week as well. :) For more menu ideas, check out orgjunkie.com. Here are a few more photos of the items I sent my partner in the Boo Spooky Apron Swap. I think the apron is really cute, and I thought my treat bag turned about pretty well, also. I did forget to send a pot holder (sorry Sharon), but I did put some goodies in her treat bag that hopefully she will enjoy. I received my apron from my swap partner, Sharon, for the Boo Spooky Apron Swap! It is absolutely adorable! Sharon made it reversible so I can wear it year round. She also sent me a reversible bag to go with it. Thanks for such a lovely package, Sharon! Here are some pictures of my gift. This is a wonderful breakfast dish that is really easy to make. In an 8-in. ovenproof skillet over medium heat, saute onion and zucchini in oil for 2-3 minutes. Pour eggs over top; sprinkle with salt. Cook until almost set, 6-7 minutes. Sprinkle with cheese. Bake at 350 degrees F for 4-5 minutes or until the cheese is melted. Makes 2 servings. A different twist on traditional meatloaf. mixture evenly in a 9-inch pie pan, running up the sides just slightly. degrees for 30 minutes or until done. Drain any excess grease from pan before cutting into wedges and serving. Rinse chicken and pat dry. Lightly brown chicken over med-high heat in oil. Place potatoes, onion, and garlic into a slow cooker. Top with chicken. Stir together honey, juice, cornstarch, rosemary, salt, and pepper. Pour over chicken. Cover and cook 6-8 hours on low or 3-4 hours on high. Serve garnished with rosemary if desired. Brown beef and onion, drain well. Stir in remaining ingredients. Mix well. Cover and simmer for 30 minutes. Serve on wheat bun.